The Gerber StrongArm is an American made full tang fixed blade knife. 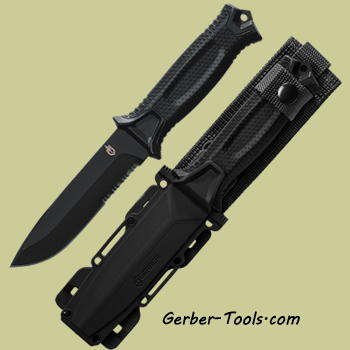 This Gerber 30-001060 model is in black color and comes with a MOLLE compatible sheath that can be mounted in several different possitions. The full tang blade is nearly one-quarter inch thick and is built out of USA-made 420HC (high carbon) steel. The 420HC steel is well know for its ability to be sharped to razor sharp in a reasonable amount of time. The edge rention is also just as reasonable. The handle is built from glass-filled nylon and has a textureized rubber overmold on it for a tight, comfortable grip.